Situated on the sandy shores of Kushog Lake, our 2 bedroom self-catering cottages feel just like home. Our cottages sleep 4 comfortably, and hold up to 6 people (charges apply for extra persons, maximum of 2). Relax in front of the wood burning fireplace after a day of sledding in the beautiful Haliburton Backcountry. Jump into our lake off of your own dock to cool down after a great day of ATV-ing. 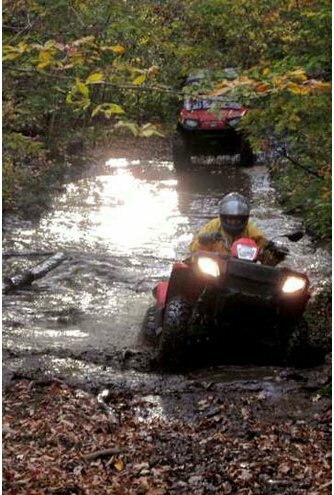 We are on top ATV and snowmobile trails. Stay with us and ride from your doorstep! Rates: from Cdn $140 per day and Cdn $900 per week. Kushog Korners has something for everyone. If your cottage vacation is all about relaxing, you’ve come to the right place. Each 2-bedroom cottage has a large screened porch, its own fire pit, picnic table and boat dock! Rent one of our canoes or aluminum boats, or bring your own and set out from our boat launch. If that’s too fast-paced for you, stretch out on the dock or the beach to bask in the sun, or pull a lawn chair under our shade trees and spend time with a good book.